Everything you’ve grown to love about the Gevril Avenue of Americas is now available in a smaller size. The familiar Gevril Avenue of Americas rectangular design has become a modern classic. Based on a historic case design that was discovered in Gevril’s Swiss archives, this signature watch has a distinctive retro look that has been updated with an elegant beveled dial featuring beautiful raised serif numbers. Men and women alike have grown to love this luxuriously elegant design, but some women always wished their favorite watch were available in a size more suitable for a tiny wrist. Now it is! 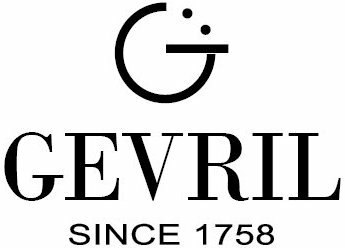 Like the original Gevril Avenue of Americas, the Mini Collection is hand crafted by master watchmakers at the company’s manufacturing facilities in Switzerland. 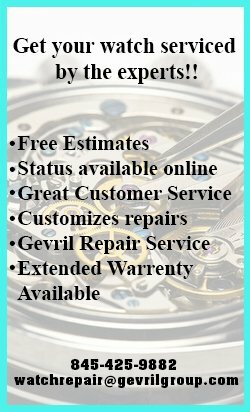 These hand crafted timepieces feature top-quality Swiss made quartz movements, surgical grade 316L stainless steel cases, natural mother of pearl dials, and on some models, even full cut genuine Wesselton diamonds. 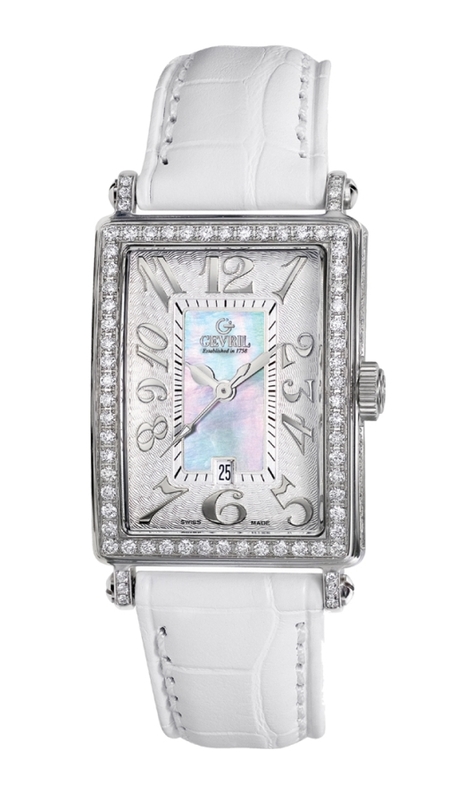 A gracefully curved scratch-resistant sapphire crystal protects the elegant rectangular dial with its intricate guilloché finishing and distinctive deco inspired serif numbers. This classic three-hand configuration is water resistant to 165 feet, has a convenient quick-set date window at 6 o’clock, and has been equipped with a luxurious Alligator textured calfskin band in six available fashion forward colors. 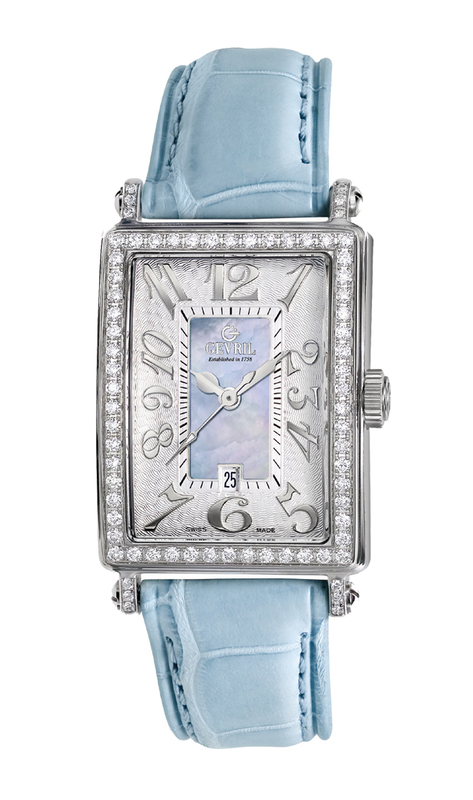 A deluxe edition of the Avenue of Americas Mini is available with a genuine mother of pearl dial, along with a bezel and lugs embedded with up to 131 top Wesselton full cut diamonds. Each of these fine diamonds is precisely calibrated and set using state-of-the-art CNC machines for a uniformity that is unmatched in the industry. 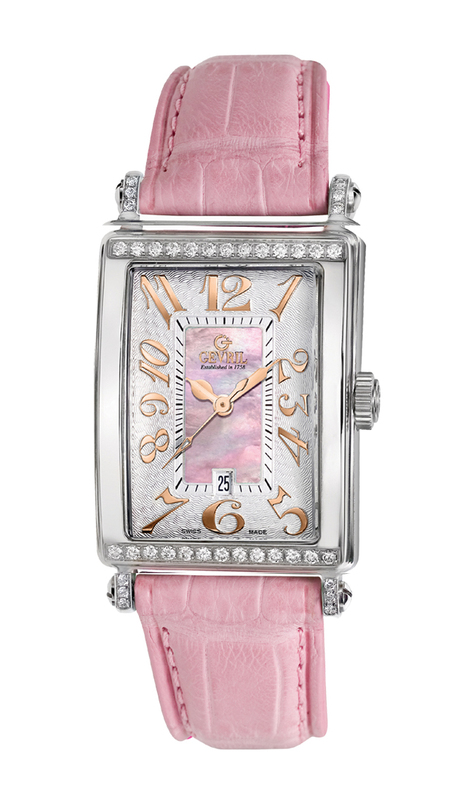 These amazing watches blur the boundaries between a fine watch and the finest jewelry. 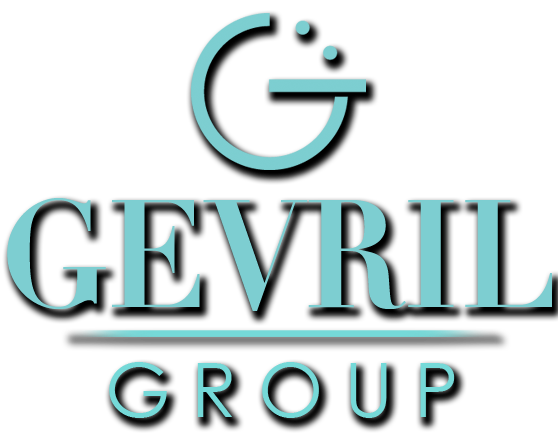 Since the production of Gevril fine timepieces is strictly limited, only a few select individuals will ever have the opportunity to own a Gevril Avenue of Americas Mini. One of those lucky people could be you, so if you’ve been wishing that the Avenue of Americas were available in a smaller size, the time to act is now. 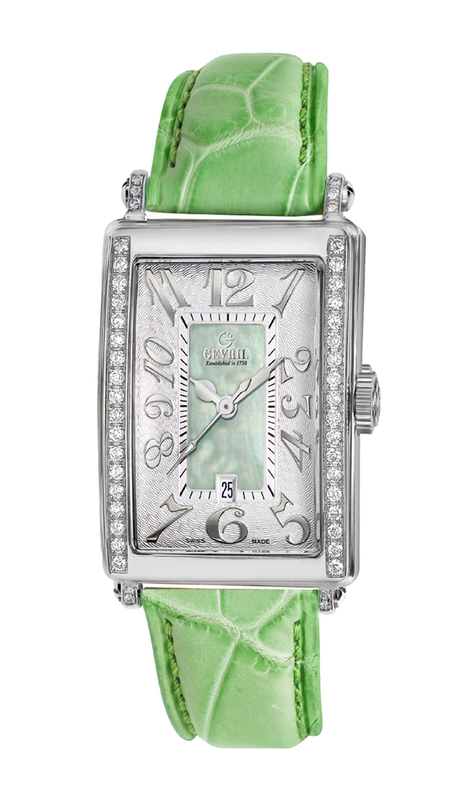 To put one of these classic beauties on your wrist, contact an authorized Gevril dealer immediately.